Know a girl who loves her American Girl Dolls? Head to Amazon for a hot doll clothes & accessories (including play food) deal! There are over 700 excellent customer reviews!! Hurry and get the Weardoll 18inch Doll Clothes and Accessories – 33 Items, 18 inch Doll Accessories fits American Girl Doll Accessories, Mylife Doll Accessories today for only $59.95 $39.19 from Amazon! Check out all of the Amazon deals here! FITS ANY OCCASSION – rain outfit with umbrella, party dress, casual wear set, summer outings and swimsuit and many more. Make your doll the best dressed doll with our super value holiday collection, featuring 33 piece hand design outfits and accessories. It is made especially for your daughter and her doll who are sure to have lots of adventures together with the matching bags. This set includes five outfits & lots of fun accessories (33 pieces including matching travel backpack). Party Dress Set: Dress, Fur Shawl, Necklace, Lipstick, Rabbit Ear Hair Tie Bands and Pink Chocolate Chip Muffin. 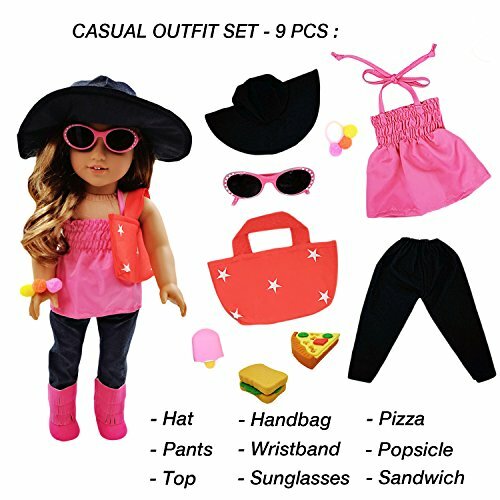 Casual Outfit Set: Hat, Tank Top, Pants, Handbag, Sunglasses, Wristband, Pizza, Popsicle and Sandwich. Swimsuit Set: Swimsuit, Bathing Cap, Goggles, Cover Up, Hamburger, Hawaiian Plumeria Flower Clips and Ice Cream Treats. Rain Outfit Set: Yellow Fashion Raincoat, Sea lion Umbrella, Hotdog and Drink. Sequin Dress Set: Sequin Dress, Necklace, Flower Hair Clip, Cake, Fries and Milk Shake. TOTAL of 33 pieces you will be getting in this one SALE! Buy the Weardoll 18inch Doll Clothes and Accessories – 33 Items, 18 inch Doll Accessories fits American Girl Doll Accessories, Mylife Doll Accessories from Amazon. Previous articleRetro Bathing Suits for Women – HOT (Promo Code) Deal!